Released on Thursday, June 12, the three-inch Arches silver coin notched sales of 21,301 by Sunday, June 15. The immediate prior America the Beautiful Silver Five Ounce Silver Uncirculated Coin, celebrating Shenandoah National Park, debuted with sales of 20,120. The first 2014-dated coin honoring Great Smoky Mountains National Park had a higher early total of 21,415, but this tally was from a longer reporting period of a Monday through to Sunday. Coins this year are receiving support from, among other things, lower prices. With the U.S. Mint’s subscription promotion this year, subscribers to the 99.9% fine silver series are receiving a 10% discount and that brings their price down to $139.45 from $154.95. Finally, the U.S. Mint has bumped up mintages but that doesn’t seem to be affecting sales. The first 2014 release commemorating Smoky Mountains had a mintage of 25,000, and sold out, while the two most recent coins have mintages each of 30,000. 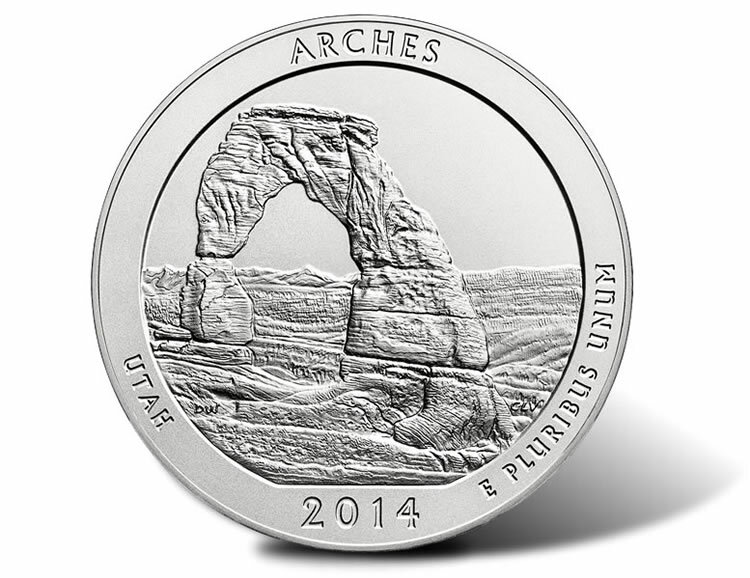 Still upcoming in 2014 are coins celebrating Great Sand Dunes National Park and Everglades National Park. *Time periods for first reported U.S. Mint sales figures of the 2012-dated America the Beautiful silver coins were one week or one day less than one week. Conversely, the 2013- and 2014-dated silver coins mostly have debut sales reporting periods from Thursday to the following Sunday. **As mentioned, the 2014 Great Smoky Mountains silver coin is the exception with its first sales period from a Monday to Sunday. America the Beautiful Silver Five Ounce Silver Uncirculated Coins feature the same designs as the companion America the Beautiful Quarters. Designs feature national parks this year, where most years there is a mixing of designs that that include other national sites like forests and memorials. The five ounce coins are different in composition and size, obviously, but they also have flat edges compared to the reeded edges of quarters. On the edge of the silver coins are edge letters of ".999 FINE SILVER 5.0 OUNCE."